I have definitely got a soft spot for Asian-style food – a spot about as big as Asia itself. This utterly delicious Indian lamb mince pie is just one of so many Asian-style dishes that I Love. I add a garam masala spice mix to this dish. You can use a ready-made mix if you want to, but I will also give you the recipe for a spice mix that I make myself. It requires a bit of elbow grease to make yourself – unless you’ve got an electric grinder, of course – but I think it is fun and rewarding to make. This will make more garam masala than you need for this recipe - it will keep for months though, if you store it in an air-tight container in the fridge. Apart from being super-tasty, this Indian lamb mince pie is quite healthy and relatively low in calories. The fat mainly comes from the meat. The only other fat I use myself is coconut fat, a healthy type of fat which can help to promote weight loss. 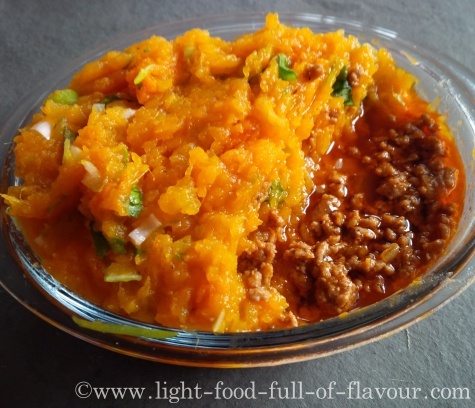 I use butternut squash and sweet potatoes for the mash – more squash than sweet potatoes though. While both vegetables contain slow-releasing carbohydrates, squash contains fewer carbohydrates and for that reason it is better for your weight. 1. Preheat the oven to 200C/fan 180C/400F/gas mark 6. Place 1 tablespoon of oil and the diced squash and sweet potatoes in a roasting pan/tray and mix together. Cook in the oven for about 30-35 minutes – until the vegetables are soft. 2. While the vegetables are cooking, place 2 tablespoons of coconut oil in a large frying pan over a low heat. Add the chopped onion to the pan and cook for 5 minutes, stirring every now and then. 3. Add the garlic, chilli and all the spices to the frying pan, stir and cook for a further minute. Turn up the heat to medium and add the mince. Stir to break up the mince and brown all over. Once the mince is browned, add the tomato puree and water. Season with some salt, stir and bring to a simmer. Lower the heat and continue to simmer for about 25 minutes. 4. Once ready, take out the diced squash and sweet potatoes from the oven. Use a potato masher or fork to mash the vegetables. 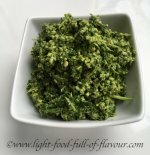 Add the chopped spring onions (scallions) and coriander (cilantro) to the mash, season with some salt and pepper and mix it all together. 5. Place the cooked mince in an oven-proof dish and top with the mashed vegetables. Cook in the oven for 10-15 minutes – until piping hot. I like to serve this Indian lamb mince pie together with a large salad full of peppery leaves – such as water cress and rocket (arugula) – and different coloured peppers (bell peppers).